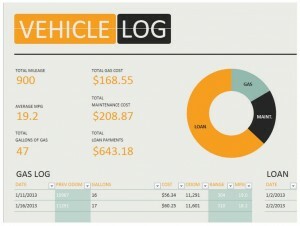 Whether you are a company or individual, tracking the maintenance and other costs on vehicles is important. It helps to ensure costs are kept within the available budget and to pinpoint any adjustments that need to be made. The vehicle maintenance checklist simplifies this process, making it easy to both input information as well as tracking the expenses. Providing the information in both logs and graphs on the vehicle maintenance checklist allows the user to easily see the expenses for gas, maintenance, loan payments, average mpg, and more; ensuring the vehicle maintenance checklist is customizable for each individual vehicle. As an added bonus, using the template is so easy that time spent tracking expenses will be significantly diminished. And you can download the vehicle maintenance checklist right here, FOR FREE. Input the starting Odometer reading in the top right of the template by clicking in the available formatted cell. Input the date, gallons, cost, and new odometer reading in the appropriate cells under the “Gas Log”, which can be found on the left hand side under the total’s section. Input the date, item description, amount, check number and any remarks in the appropriate cells under the “Loan Payments” section (if applicable), which can be found on the right hand side under the GAS/MAINTENANCE graph. Input the date, item description, cost, odometer reading, and any remarks in the appropriate cells under the “Maintenance Log” section, which can be found on the right hand side under the “Loan Payments” section. Make sure the information is in the correct field for proper tracking. Organization is extremely important to any business: Add additional sheets to excel for multiple vehicles prior to inputting information to ensure each vehicle is tracked properly. Companies should not combine multiple vehicles into one vehicle maintenance checklist. Each vehicle should have its own checklist. Additionally, each sheet can be renamed to be able to identify the vehicle associated with the specific vehicle maintenance checklist.